Through the use of rope access, we can highly speed up the process of protecting structures from corrosion. 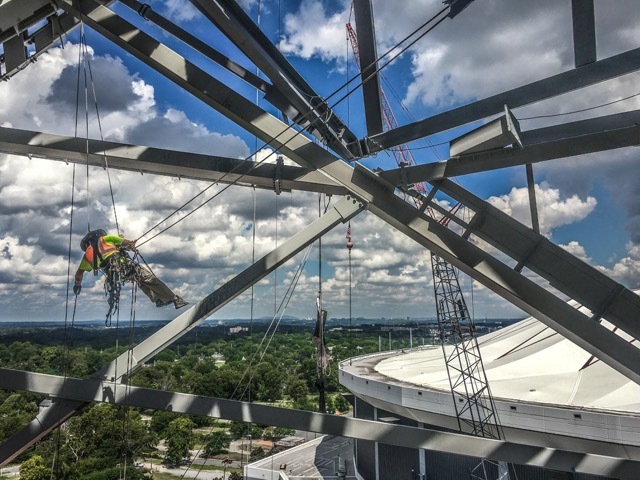 Ascension offers painting and coatings experience on many different kinds of structures such as stadiums, bridges, buildings, tanks, and chimneys. 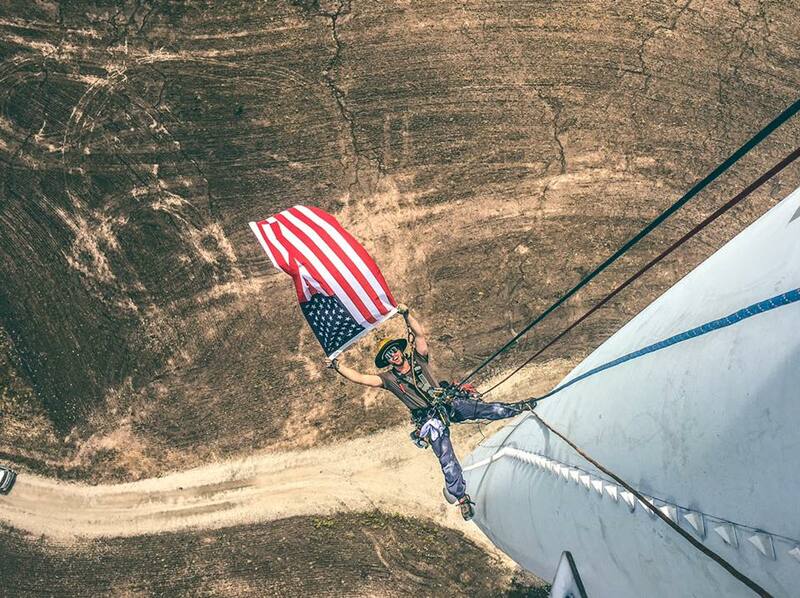 A perk of rope access is the means of mobility. 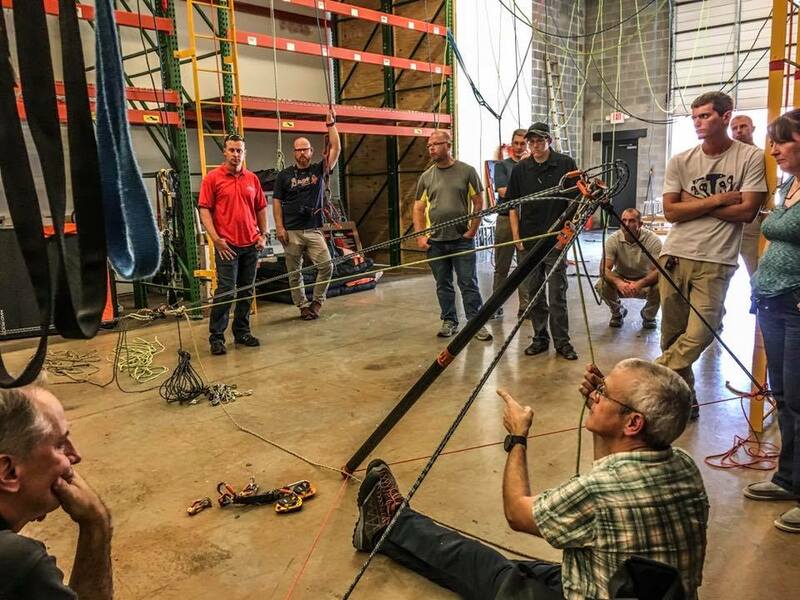 Swing stages, spider baskets, and scaffolding are becoming more and more obsolete because of the safety and efficiency provided by rope work. Motorized work seats (gas and electric) that operate on a safe redundant two rope system can mobilize in/out in a matter of hours, only leaving trace of the high quality finished product. Following thorough inspections often times comes maintenance and repair. 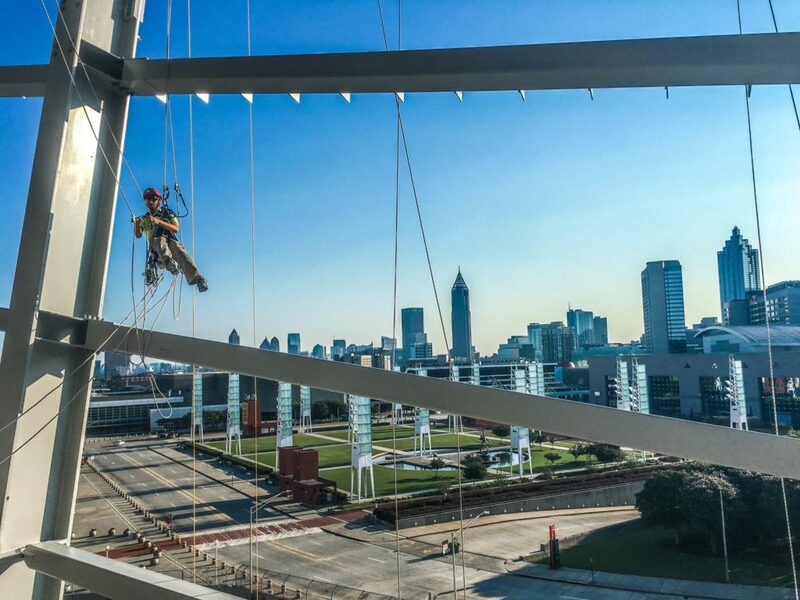 Welding, concrete/mortar repair, and composite/fiberglass work can all easily be achieved by rope access. Whereas simple visual inspections often times lead to maintenance on the building’s external features. 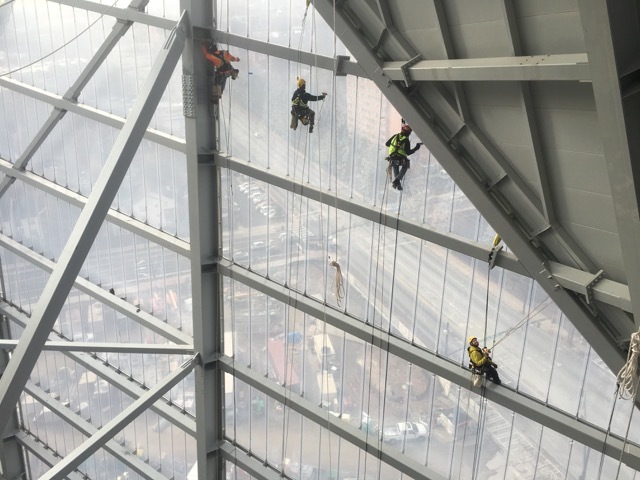 Whether it is fixing a leak or changing out a security camera, the ease and efficiency of safe rope access allows for a time and cost-effective solution. 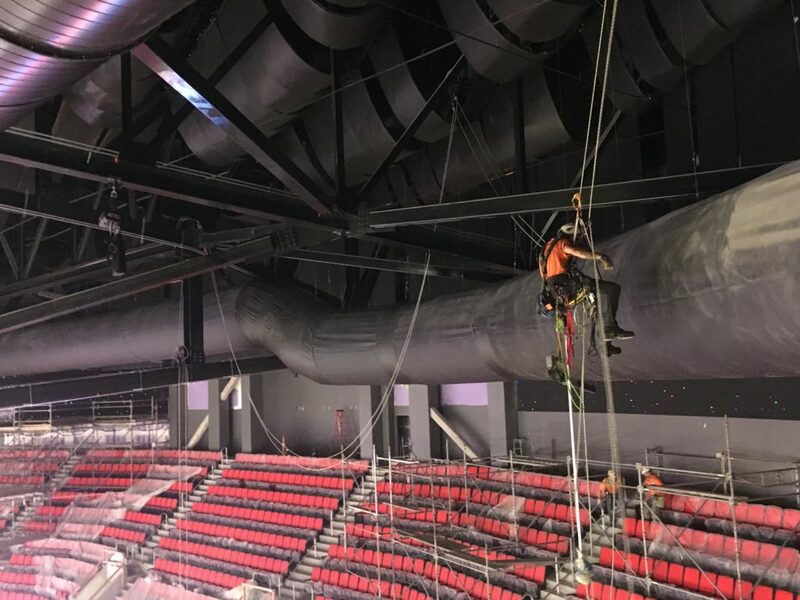 When it comes to the veins of a building, critical access areas often times arise and creative methods are used to assist other trades in completing the project. 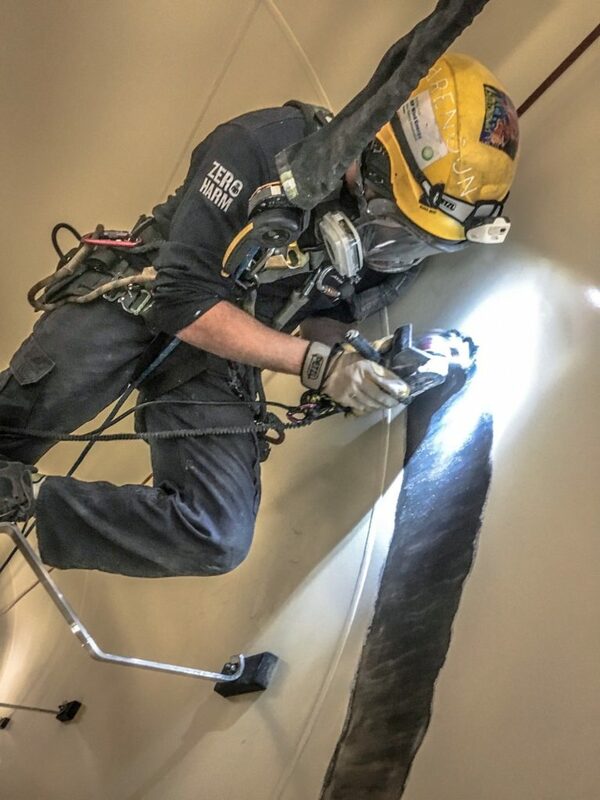 Rope access and our highly trained team can provide safe access solutions and trade experience in both sheet metal/duct work installation and pipefitting. Our team’s knowledge and training in the precision use of a Trimble Survey unit are often times effective in locating appropriate hanging locations. Ascension is also able to provide a safe and efficient means of access for a tradesman to work alongside us. Frequent access to hard to reach areas of buildings and steel structures is often times presented. A safe solution for fast access could be a series of life line systems. We can offer the installation of temporary rope systems needed to be put in place for a shorter amount of time, or permanent steel cable systems expected to last the life of the building with proper maintenance and inspection. Our fall arrest and fall prevention system allow easy access for other trades to do their job safely. Naturally built into a rope access team is also a vertical rescue team. Our highly trained technicians can not only preform self-rescue, but can also provide vertical rescue support from anywhere on a structure for other trades who are not having the best day. Safety and the well-being of a worker at height is of the highest priority at Ascension, through proper training and field experience we can ensure that a rescue is available at all times for all workers. Is a valued employee/tradesman not SPRAT certified? Not a problem, we can offer a safe and efficient means of access to certain structures even still. When these employees need to inspect, investigate, and formulate solutions of their own; Ascension can offer facilitated access. 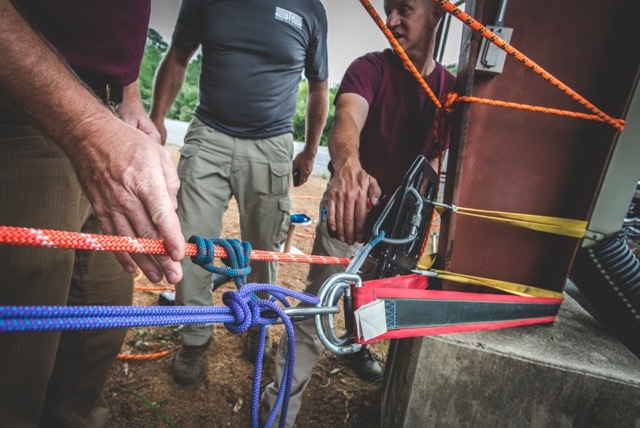 This is a safe and controlled solution, allowing Ascension complete control of the rope system and giving us an instant form of rescue if anything bad were to occur. With any entertainment venue comes the lights, sound, and action. Following that comes the complex rigging, inaccessible locations, and overhead loads. Through precision, patience, and problem solving, we can make a venue come to life. This allows a venue to market, promote, and entertain to a much higher level which is something we here at Ascension greatly respect and support. Weather, time, and corrosion all heavily impact structures throughout the world. To ensure structural and overhead hazards are never presented to pedestrians or workers a thorough inspection process needs to occur. Our team consists of certified inspectors from all walks of life, from NACE 3, CWI, and NDT to experienced composite fiberglass workers we can ensure the integrity of the structure. Through proper training, reporting, and documentation we can offer clients a professional means of assurance. 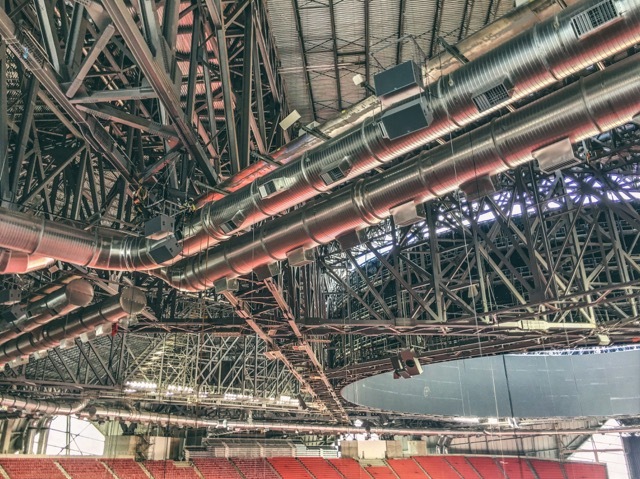 Found in many modern-day buildings throughout the world, fabric materials such as ETFE & PTFE are being used for roofs and walls. The installation processes of these materials normally require specialized workers with innovative access. Whether it be the installation of safety netting for a client’s employees to easily access and work, or providing technicians who are experienced in the scope to preform skilled vertical access, Ascension has a solution for you.